John Peter Petrucci (born July 12, 1967) is an American guitarist, composer and producer. He is best known as a founding member of the progressive metal/rock band Dream Theater. With his former bandmateMike Portnoy, he has produced all Dream Theater albums since their 1999 release, Metropolis Pt. 2: Scenes from a Memory until their 2009 release, Black Clouds & Silver Linings, and also produced alone their 2011 release A Dramatic Turn of Events and 2013's Dream Theater. He also sings backing vocals for Dream Theater. 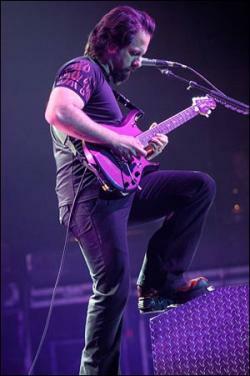 Petrucci was named as the third player on the G3 tour six times, more than any other invited guitarists. In 2009 he was named the No. 2 Best metal guitarist by Joel McIver in his book The 100 Greatest Metal Guitarists. He was also named as one of the "Top 10 Greatest Guitar Shredders of All Time" byGuitarOne magazine. In 2012, Petrucci was ranked the 17th greatest guitarist of all time by a Guitar World magazine readers poll.